One Smart Place | Truthfully, is it fair? Here are two stories: the first is about truth and lies (and confabulation). The second is about the science of something called captivology. In ICAEW Economia, Mike Straw, CEO of Achieve Breakthrough, argues that companies need to have a genuinely open culture about setbacks. Otherwise people will ‘edit the truth’ about how projects are faring which can have implications for financial reporting. There’s something you may have heard about. It’s called Confabulation. It isn’t lying as such. Confabulation is distinguished from lying as there is no intent to deceive and the person is unaware the information is false. It happens when a person fills in gaps in their memory with fabrications that they, more or less, believe to be true facts. 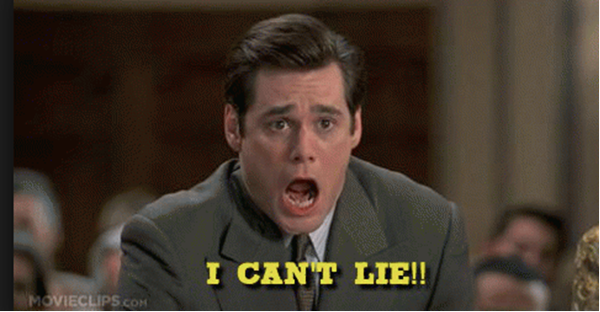 When Max Reede in the 1997 film, Liar Liar tells his father, Fletcher (played by Jim Carrey), that his teacher told him that ‘beauty is on the inside’, he responds promptly and honestly (in his own view) that ‘this is just something ugly people say.’ Perhaps not an advisable approach for good parenting, but what if people in business always told the truth? Would this help the FD and the accountants auditing the books? In the past year alone the truth – or lack of it – has been a key component in a number of business scandals. From Tesco allegedly falsifying profits to Apple who are being sued for misrepresenting the amount of storage on iPhones and iPads, the truth – or the bending of it – is a key issue in business today. Accounting scandals have become almost a regular feature of the news these days. From a book review from HarperCollins: Why are we captivated by sites like Facebook and Instagram, but couldn’t care less about MySpace? Why do some musicians grow as popular as Beyoncé, while others never make the charts? Why do some non-profits, such as Charity: Water, succeed in getting our donations, while other charities are ineffective? And why can’t anyone seem to ever get the attention of their kids? 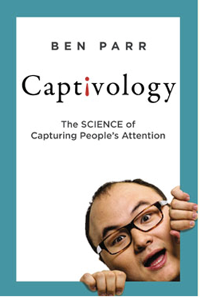 In Captivology, Ben Parr, former editor of Mashable and cofounder of DominateFund, reveals how and why our mind pays attention to some events, ideas, or people and not others. Vividly bringing to life the stories of entrepreneurs, musicians, filmmakers, thought leaders, political strategists, magicians, and other masters of attention, Parr presents a new understanding of how attention works and identifies seven captivation triggers—techniques guaranteed to help you capture and retain the attention of friends, colleagues, customers, fans, and even strangers. These triggers spark our brain’s attention response systems by appealing to fundamental aspects of human nature. Combining the latest scientific research with interviews of visionaries who have successfully brought attention to their ideas, projects, and companies (Facebook’s Sheryl Sandberg, film director Steven Soderbergh, LinkedIn’s CEO Jeff Weiner, New York Times bestselling author Susan Cain, and more), Parr makes the case that you can rise above the noisy crowd and be heard—without having to shout. Insightful and practical, Captivology will change how you tell your kids to clean their room, deliver your next presentation, convince the world to support your cause, or attract users to your product. Captivology is published by HarperCollins £16.99: Available 3 March. Customers Want to Talk to You, So Why Aren’t You Listening? Are You Reaching Out to Customers Who’ve Moved to Your Area? From Informita: this is a FREE Mobile App available on Windows, Apple, Android, Blackberry and Kindle. Informita have designed this app to give fast and efficient link to the latest news and developments on working capital, cash flow and procurement. You will have instant access to our latest twitter and Facebook feeds, Informita’s weekly blog and quarterly newsletter so that you can be up to date on the latest developments about working capital, cash flow and procurement. This brings the latest news on working capital and procurement directly to your fingertips. From the clever people at How to Geek: The Internet is supposed to be a global network that links the entire world, but many websites are confined to specific countries. Unsurprisingly, piracy is higher in countries where content isn’t legally available. These are the ways people around the world are actually accessing that geo-blocked content today. If you live outside the US, this will get you a lot — and even US residents might want to access BBC iPlayer or a similar service sometimes. Hola is one of the most popular ways to access geo-blocked websites, and there’s no sense in ignoring that. This is primarily because it’s free and easy-to-install. Hola, formerly known as “Hola Unblocker” and now known as “Hola Better Internet,” is available in a variety of forms. It offers browser extensions for Chrome and Firefox, and these can be easily installed with a few clicks. After, just click the Hola icon on your browser’s toolbar and select a country. It’ll route your browsing activity through IP addresses in that country. This means you can access the US Netflix library from your current country, or the UK-based BBC iPlayer website from USA, for example. In the Telegraph: In an exclusive interview: The Apple chief executive Tim Cook reveals to Allister Heath how the revolutionary features in the company’s smartwatch could forever alter our daily lives. Like millions of people, Tim Cook stopped wearing a watch a while back. The Apple boss no longer needed one: his iPhone told the time just fine. There was just one problem, as he readily acknowledges in his interview with The Telegraph: glancing at one’s wrist can be a very useful way to find out information. It is less rude and less intrusive. So Apple now wants to pull off something that no company has ever managed before: it wants to reverse a cultural trend that it had created itself. It wants us to start wearing a watch again. The big event on 9 March will showcase the Apple Watch; and it will be launched to consumers in April. Cook, needless to say, is already wearing his new Apple Watch. He couldn’t even contemplate living without it anymore, he says. 93% of marketers use content marketing. Brands were 36% more confident about the ROI of content marketing last year than they were in the year before. 58% of content marketers plan to increase their budgets to create more content over the next year. 73% of marketers were producing more content at the end of 2013 than they were the year prior. Idea Generation: What types of content should my company create? Sourcing Talent and Content: How do I find writers and manage content creation? Workflow Management: How do I keep everything organized? Impact Analysis: How do I measure successes and identify areas for improvement? In CITY A.M.: Samsung has unveiled two flagship Galaxy S6 smartphones in Barcelona marking the start of this year’s Mobile World Congress. The S6 and its curved screen sibling, the S6 Edge, are the South Korean conglomerate’s latest attempt to restore growth to its smartphone division, which has seen margins and profits erode in the face of competition. The S6, which also comes in a curved glass S6 Edge version, boasts an even thinner body than its predecessor the S5, built-in wireless charging compatible with the charging pads being rolled out by McDonalds and Starbucks, and Samsung Pay, a mobile payments system launching in the US this summer to rival Apple Pay. Read on 123-Reg: By Will Stevens who asks – How much of your website traffic comes from Google? What would happen if that source of potential customers were to dry up overnight? Would your business be able to cope if your search engine rankings suddenly plummeted? Maybe they already have and you’re wondering where your next customer is going to come from. If your site has been penalised by Google, or you’re worried that a penalty might be heading your way at some point in the future, it’s important that you start attracting visitors from sources other than organic search. If you’re unsure as to whether your site has been penalised by Google, then this guide will help you find out. It will also tell you how you can get on the road to recovery. Unfortunately, recovering from a penalty can be a long process. So while you’re working on getting a penalty removed, here are five ways to attract traffic and potential customers. If you were attracting most of your customers through organic search before you were penalised, these alternative channels could be what you need to keep the sales coming in. And remember, even if you haven’t been penalised, it’s never a good idea to be overly reliant on one source of traffic. Adopting these methods before something happens to your search rankings could save you a lot of trouble if your site does one day fall out of favour with Google. From NewsCred Blog, By Chase Neinken: It is no secret that storytelling has become the pinnacle practice of 2015. So what can content marketers learn from some of the best stories going right now? Looking ahead to a new “House of Cards” release on Netflix, the author began to think about the parallels between content marketing and traditional media (in this case television). In Kevin Spacey’s keynote from Content Marketing World 2014, he told a half hour story about the importance of storytelling using his own career as a vehicle and the stories of the actors he’s played along the way as the gasoline. I distinctly remember this being one of the most #meta speeches the author has ever heard. FREE from Wiley: This book will prepare you with a host of updated tools for today’s environment, as well as expanded coverage so you can confidently start using Ubuntu today. As a longstanding bestseller, Ubuntu Linux Toolbox has taught you how to get the most out Ubuntu, the world’s most popular Linux distribution. With this anticipated new edition, Christopher Negus returns with a host of new and expanded coverage on tools for managing file systems, ways to connect to networks, techniques for securing Ubuntu systems, and a look at the latest Long Term Support (LTS) release of Ubuntu, all aimed at getting you up and running with Ubuntu Linux quickly. Mac OS X users like to make fun of Windows users as the only ones that have a malware problem. But that’s simply not true anymore, and the problem has increased dramatically in the last few months. This article exposes the truth about what’s really going on, and hopefully warn people about the impending doom. From How to Geek: You’ll need a unique product key to reinstall Windows on your PC. This is more confusing than it sounds — you may not be able to re-use the key your computer’s manufacturer used. Reinstalling Windows often feels necessary, especially on new PCs that come packed with bloatware. You can legally download Windows 7, 8, and 8.1 installation media directly from Microsoft. Stored in software on your PC: When you (or your PC manufacturer) installs Windows, Windows stores its product key in the registry. You can extract this product key, and — often — enter it when reinstalling Windows on your PC. Crucially, you’ll need to grab it from your operating system before you begin reinstalling Windows or it could be deleted if you format your hard drive. Printed on a sticker: Some PCs use a technology called “System Locked Pre-installation,” or SLP. If your PC uses this, the product key on your PC — the one stored in the registry, and the one key-viewer applications display — will be different from the actual key your PC needs. The actual key is on a certificate of authenticity (COA) sticker on your PC or its power supply. The one in the registry and key-viewer application is a red herring. This system was common for Windows 7 PCs. Embedded in your PC’s UEFI firmware: Many newer PCs that come with Windows 8 use a new method. The key for the version of Windows the PC comes with is stored in the computer’s UEFI firmware or BIOS. You don’t even need to know it — assuming you’re installing the same edition of Windows the PC came with, it should automatically activate and work without you needing to enter a key. It’ll all happen automatically. From missing payments, juggling credit cards, loans, mortgages, telephone and internet bills, cash flow is the issue most likely to influence a business’s operations. Even the most successful of SMEs can struggle. Future business growth hinges on your ability to resolve these issues – luckily there are some easy steps you can take. The latest SmartCompany eBook, Payment systems made simple – how to get cash flowing in your SME, brings to light the difficulty that companies face in regulating their cash flow and offers up strategic tips for your peace of mind. A mobile payment strategy, and much more. Work-Life Balance For Dummies eBook (a $21.99 value) FREE until 3/7! From Wiley: Work-Life Balance for Dummies offers readers advice and simple strategies to achieve more balance whatever their situation. A survey conducted by Universum Communication found that work-life balance is No.1 on the list of short-term career goals amongst professionals. But while work-life balance is an increasingly popular term, many of us are still unsure about how to achieve it, or lack the confidence to approach employers to negotiate flexible working hours. From TradePub: Download this kit to learn everything you need to know about IT Management. The Essentials of IT Management Kit Edition brings together the latest in information, coverage of important developments, and expert commentary to help with your IT Management related decisions. The Essentials of IT Management Kit Edition, brings together the latest in information, coverage of important developments, and expert commentary to help with your IT Management related decisions. Found in Business Matters: Most people who we think are working hard are mismanaging their time. When it comes to many of the people who we think are hardworking, we’re really just misinformed, says Inc. For instance, it is a common thought that people who work late are hardworking. Why? Because the assumption is that they have so much work to do that they must burn the midnight oil to get it done. Another example is when we see people who always seem like they are busy all the time. Again, they have taken on so much work that they must work all the time. This article provides some easy ways to do this that most people don’t take advantage of. Start using these strategies today and watch your daily output increase significantly. From ICAEW: Thousands of people have started new businesses already this year. For anyone thinking of starting a new business, there are some questions you need to know the answer for before you get going. When should I write a business plan and how do I do it? How much money will I need to set up my business? How can I raise the finance I need for my business plans? How should I approach recruiting new staff? Should I go into partnership with someone else? Do I really need an office? What marketing and advertising should I be considering? How do I find the business support and advice I need? From AccountingWEB: iXBRL, RTI, IFRS, AE and new UK GAAP: Download this FREE new whitepaper for ‘Acronyms: Explained’ + top tips for easing the compliance burden. The new whitepaper from IRIS reviews developments in the compliance landscape. It also includes some tips for easing what otherwise threatens to be an escalating burden on busy corporate finance professionals.